Two historic events took place in Bolivia this week. Indigenous groups protesting the government’s plan to build a highway through the TIPNIS national park and autonomous territory arrived in La Paz on Wednesday, after a 65-day, 360-mile cross-country trek that has riveted national and international attention. Just three days earlier, Bolivian voters turned the country’s first-ever popular judicial election into something of a plebiscite on President Evo Morales’ government, an event which could have significant implications for the TIPNIS conflict. 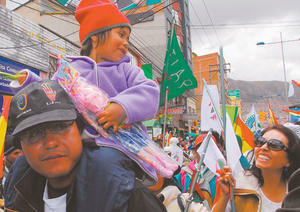 In La Paz, tens of thousands of well-wishers formed a human chain along the march route to welcome the 1,200 TIPNIS march arrives in La Paz. Credit: La Razón. indigenous protesters and their supporters. Serenaded by church bells, the marchers received the “keys to the city” from the Mayor in recognition of their “valiant and heroic” journey. Cooks from 30 local markets provided traditional food and beverages, while universities are offering shelter. The marchers were scheduled to meet Thursday evening with Morales. They have vowed to remain in La Paz until the proposed highway is permanently cancelled and defunded. In Sunday’s non-partisan judicial elections, according to preliminary results, some 45% of the voters voided their ballots and another 16% left them blank, leaving only 39% valid votes. The voided ballot ("voto nulo") percentage was by far the highest in the 26 years of Bolivia’s modern democracy, breaking the previous record of 6% in 1989. Opposition parties campaigned hard for the voto nulo, as a protest against what they perceive as excessive MAS (Movement Towards Socialism) government control of the candidate selection process, and of the political system in general. 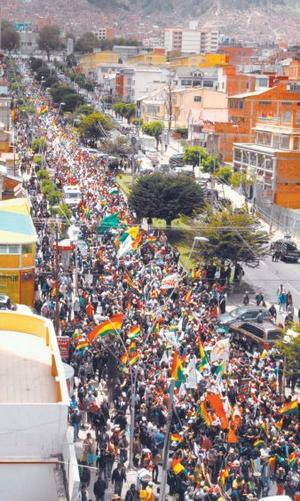 (Since voting is compulsory in Bolivia, a voter boycott is not a practical protest option.) In turn, Morales actively championed the popular judicial vote—mandated by the 2009 Constitution—as a cornerstone of his “decolonization” program, to bring transparency and accountability to Bolivia's corrupt and inefficient judiciary which historically has been elected by the Congress. To ensure non-partisanship, election guidelines called for disqualification of candidates with recent political party connections. Morales predicted a landslide 70% vote for the judicial candidates, topping his own 6-year record of electoral victories—54% in the 2005 election, 67% in a 2008 referendum on his presidency, 62% in a 2009 referendum on the new Constitution, and 64% in his 2009 reelection bid. But according to the preliminary count, roughly half this target was achieved by valid ballots cast, despite the government-sponsored massive mobilization last week to rally the vote. While opposition forces and the media have been quick to proclaim a crisis of legitimacy for Morales, arguing that 60% of the votes (voided plus blank ballots) were “against” the government, the reality is more complex. As the government notes, specific problems with the electoral process, including the 114-candidate “mega-ballot” and the lack of adequate information about the candidates, likely discouraged voters from making choices. And blank votes reveal nothing about voter intent. Analyst Marcelo Silva comments that a blank vote might have been the most intelligent choice under the confusing circumstances. According to Bolivia’s independent Ombudsman Rolando Villena, the results of the vote don’t belong to any political party but to the Bolivian people, who have wisely and creatively exercised their democratic responsibility. The government should view this moment as critical opportunity for self-evaluation, he argues. Pedro Montes, leader of the Bolivian Workers Central calls the vote a “wake-up call” to Morales from the Bolivian people. With respect to TIPNIS, the credibility gap revealed by the judicial vote could reinforce factions within the MAS government who are more sympathetic to the protesters’ concerns. For example, a public dispute among government officials surfaced last week over a new law passed by Congress (but not yet signed by the president) that mandates prior consultation with indigenous TIPNIS communities before the road can be built. While Foreign Minister David Choquehuanca and Assembly president Héctor Arce insisted that the consulta results would be binding, Morales emphatically disagreed. Morales said later that he would respect the results, in any case. Indigenous deputy Pedro Nuni announced Wednesday that at least five lowlands indigenous legislators would break with Invalid vote marked TIPNIS. Credit: La Razón. the MAS party and form an independent voting faction, an action that could threaten the MAS’ two-thirds majority in the Assembly. Nuni, who was detained with the TIPNIS marchers in the September police attack, also made it clear that the protesters’ intent is not to topple Morales but to hold him to his promises on the environment and indigenous rights. 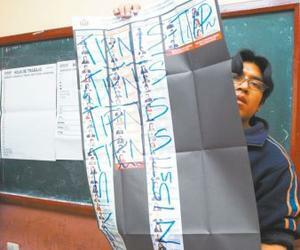 Still, even though some voters spoiled their ballots by marking them “TIPNIS” (see photo), and revulsion to the police repression has been widespread, Bolivia’s social sectors remain divided on the merits of the TIPNIS road. In La Paz, Cochabamba, and Oruro, where Morales’ rural campesino support base (that strongly favors the road) is concentrated, voters demonstrated their continued loyalty by casting a higher percentage of valid votes than in Bolivia’s other 6 departments. How Morales will weigh the political calculus of these diverse pressures, in the wake of the judicial elections, remains to be seen.